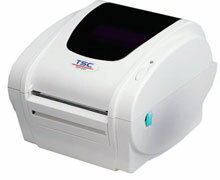 The TSC TDP-345 offers high resolution 300 dpi printing at speeds up to 5 ips. The TDP-345 comes standard with USB, parallel and serial connections. Other options include an internal Ethernet interface for easy network integration, label cutters, and a keyboard for printing labels in standalone or down-time situations. The TDP-345 is ideally suited for product marking, shipping, retail and other labeling applications. TDP-345, Direct thermal TDP-345, Includes USB, Serial, Parallel, 203 dpi, 5 ips, TSPL-EZ, USB Cable included.